It's all a question of treading carefully here (I mean, can Labour automatically count on The Sun's support at the next election! 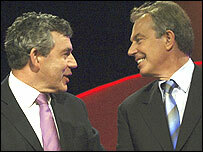 ), suffice to say that Gordon Brown should concentrate for what is best for the country. I also think that with nineteen years on the Labour front bench and nine years as Chancellor, his record speaks for itself!